Imagine a parasite that makes an animal change its habits, guard the parasite's offspring or even commit suicide. While mind-control may sound like something out of a science fiction movie, the phenomenon is very real—and has spawned a new field, neuro-parasitology. As outlined in an article published today in Frontiers in Psychology, understanding how parasites "hack" their host's nervous system to achieve a particular goal could provide new insights into how animals control their own behavior and make decisions. "Parasites have evolved, through years of co-evolution with their host, a significant 'understanding' of their hosts' neuro-chemical systems," explains one of the article's authors, Professor Frederic Libersat from Ben-Gurion University of the Negev in Israel. "Exploring these highly specific mechanisms could reveal more about neural control of animal behavior." The article describes some of the sophisticated, cunning and gruesome ways that various parasites outwit and exploit their insect hosts. One method is to affect how an insect navigates. The spores of one parasitic fungus, for example, invade an ant's body, where the fungus grows and consumes the ant's organs while leaving the vital organs intact. The fungus then releases chemicals that cause the ant to climb a tree and grip a leaf with its mouthparts. After emerging from the ant's body, the fungus releases spore-filled capsules that explode during their fall, spreading the infectious spores over the ground below. 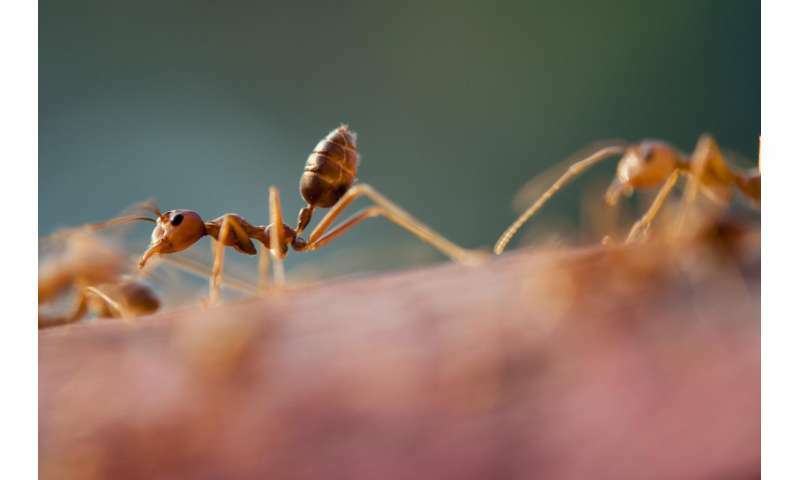 By forcing the ant to climb a tree, the fungus increases the dispersal of the falling spores and the chance of infecting another ant. Similarly, a parasitic hairworm causes infected crickets to seek out water—where they drown. The cricket's suicide enables the worms to enter an aquatic environment for reproduction. In another type of interaction, called "bodyguard manipulation," the parasite forces the infected insect to guard its young. One such parasite is a wasp, which injects its eggs into a caterpillar by stinging it. Inside the live caterpillar, the eggs hatch into larvae, which feed on the caterpillar's blood. Eventually, as many as 80 larvae emerge from the caterpillar's body before forming cocoons to complete their growth into adult wasps. However, wasp larvae are vulnerable to predators in their cocoons. To scare potential predators away, one or two larvae remain in the caterpillar and control its behavior through an unknown mechanism, so that it acts aggressively towards predators—thereby protecting the cocoons. These examples shed light on the very old and highly specific relationship between parasites and hosts. But how exactly do these parasites affect their host's behavior? Neuro-parasitology is still a young field, and in most cases, researchers do not yet fully understand the mechanisms involved. However, many such parasites produce their effects by releasing compounds that act on the neural circuitry of the host. Identifying and using these compounds in the lab could help scientists to work out how neural circuits control behavior. "Because neurotoxins are the outcome of one animal's evolutionary strategy to incapacitate another, they are usually highly effective and specific," says Libersat. "Chemical engineers can generate hundreds of potential neurotoxins in the lab, but these are random and often useless, whereas any natural neurotoxin has already passed the ultimate screening test, over millions of years of co-evolution." Nice article. Should have mentioned toxoplasma gondii. For every mention of insects in this article substitute drones.